No one in his right mind plays in commercial real estate with their own money. Other people’s money is the key. Low interest rates make it happen. Banks are eager to lend. They repackage some of these loans into highly-rated Commercial Mortgage Backed Securities that yield-desperate investors are eager to gobble up, spreading the risk far and wide. CMBS made the prior commercial real estate bubble possible, before it all blew up in 2008. And they’re making it possible now. When it doesn’t work out, as in 2008, it isn’t that much of a problem because other people’s capital gets destroyed. And so prices have been bid up again over the years since the low of May 2009, and miracles have been performed after the crash, and construction cranes are dotting cities, and one of those forests of construction cranes must have triggered something funny in Boston Fed President Eric Rosengren. He opened his eyes and counted these cranes on a short walk in Boston, and for the first time saw what had been ballooning before him for years: a commercial real estate bubble. A qualitative indicator in a major city is a simple crane count. When the number of cranes observed on a short walk in a city such as Boston reaches double digits, as is the case today, it is worth reflecting on the sustainability of such growth. But it is unclear how long that momentum can be sustained. When compared to yields available in the corporate bond market, today’s cap rates look low. The possibility of a modest decline in prices over the next year should not be ruled out. Except, as the chart shows, there have been no “modest declines” on an annual basis this entire century. It’s intoxicating boom and terrifying bust. The commercial real estate bubble and the associated mountain of loans and CMBS have reached such proportions that in September Fitch Ratings began to fret about them out loud. One potential cost of maintaining the federal funds rate at the zero lower bound for a long time is that it may incent behavior that would be discouraged in a more normalized interest rate environment. Looking forward, a potential risk of a low-interest rate environment is that investors seeking a higher return may take on too much risk in order to improve returns, perhaps not fully taking into account the higher risk that normally accompanies higher yields. 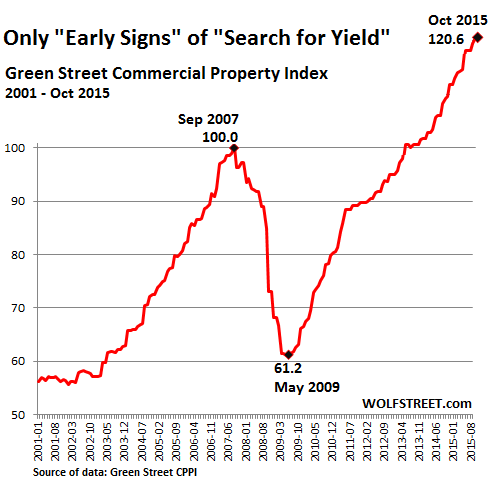 Early signs of this “search for yield” may be showing up in the commercial real estate market. Which is hilarious. “Early signs!” See chart above. Commercial real estate has been going haywire for years, whipped into frenzy by cheap money and yield-desperate investors, all a product of the Fed’s grand designs. So just now, Rosengren sees for the first time the forest of construction cranes and the soaring property prices, and maybe he’s even thinking about the debt that is piled on top of all this, the CMBS, the 110% LTV, and it’s all just the “early signs.” Which makes you wonder how big a bubble has to get before these folks realize it’s a bubble that will blow with the same or even more spectacular financial pyrotechnics as the last one. A documentary I saw on the Hearst Castle in California does a good job of documenting the boom and bust cycle. Hearst built it during the boom years of the twenties, importing luxury from around the world. During the bust he was selling the contents for pennies. The Fed misses this every time. After the spectacular messes of the last 20 years, each post-mortem they identify “low interest rates” as the catalyst, and yet here we are again, looking down the barrel of a massive residential and commercial real estate bubble. Even in my smaller city, we have apartments going up like crazy while zombie foreclosures sit rotting and existing property sells like hotcakes and everyone acts like they’re going to get rich off real estate again. The major issue this time is that last time, unlike the previous times, people who bet wrong were bailed out and eventually made whole. Thus a major lesson was learned to privatize profits and socialize losses. Keith, You are spot on. It is really easy to spend imaginary money too. Too easy for many. And of course some have been pushed to use credit to simply survive, again thanks to the Fed’s bubble blindness and the inflation that doesn’t exist, but does. Funny, but almost every thing I buy has gone up, some by double digits. The one pound box of pasta I bought last week now has 12 ounces in it. That’s a 25% inflation rate to me. I could go on …..
I’m talking a little off topic here but…. If you think your food costs a lot now. Just wait until Carbon Taxes take a hold of it. Every country in the world is in on the ” global warming ” SCAM ! Just as an example, the people in Ontario, Canada are paying the highest rates in North America for electricity, why, because they are subsidizing all of those wind mills that produce next to zero power. And in the next Oil Boom in 20 years from now, the price at the pump will be double what you saw this time if not more. 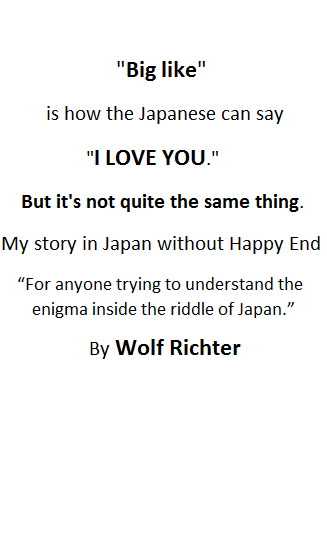 That’s a topic for yea to cover Wolf, not sure if you ever have? The Global Warming Scam that has been pumped into everyone’s heads since the early 80’s with the Ozone Layer.. remember that one. And BTW, all forms of energy are subsidized one way or the other. The oil industry is the master of getting all kinds of subsidies. I was working on Wall St. at one of the ones that went bust back in the 90’s. Carbon credits were a big discussion back then. They were making a lot of money on mortgage, credit card, and car loan derivatives and wanted to expand into other areas. Everybody knew the carbon credit idea was a big scam, the problem was getting people to believe it. Well, they managed to buy the research they needed and the rest is history. I still can’t believe people fell for it. Their other big scam at the time was 401k’s. Petunia, one needs to buy 1/3 more to get the same pasta quantity. So is it ~33 % inflation? If they took 1/2 the weight out, wouldn’t that be 100% inflation? I calculated 4/16=.25. I got a quarter less. This is hysterical! I recently attended a commercial real estate summit in NJ, where the overwhelming consensus was valuations are frothy, all from players are quite long the market. Submarkets like Hoboken, Jersey City, Summit has seen nose-bleed valuations skyrocket with 3% cap-rates seen as the new normal. It is complete insanity. Never-mind Manhattan and Brooklyn, where it no longer makes sense to build, as construction costs are well in excess of $1,000 per square foot (not including land costs!). Given these astronomical terms, builders have resorted to building high-end rentals, targeting what is called the “want to rent,” or those who can’t quite make a downpayment on a $2MM condo but would rather rent for $3-$5k+ per month. That said, construction cranes are EVERYWHERE in Manhattan. Even Donald Trump, a prime benficiary of this madness has called this a major bubble. What is striking/terrifying is that the architects of this insanity are just waking up to the thought that somethings could be off. We are all in big trouble! 3% cap rate? Damn. Never even heard of one. That is insane to the nth degree. Eric goes for a walk, how nice. He should have taken the rest of the FMOC with him. Where did this turkey think all this cash was going, to the Dairy Queen for cones? Some president! Texas has windmills because they have a lot of wind? I doubt it. With capacity utilization factors of around 20-30%, wind relies on quick start/quick stop natural gas turbines to “back them up” for 70-80% of the time. The grid requires stable voltages 24/7, not just when the wind is up. Windmills are figleaves over the fossil fuel genitalia. It’s Texas, for cryin’ out loud. If you have doubts, look it up, dude! Capacity utilization of 75% – 81%! There is all kinds of data out there on TX wind power. It’s a big deal. And it’s a money maker. If you’ve ever been in West Texas or the Oklahoma Panhandle (also has lots of wind power now), you know that the one thing you can always count on is wind. That’s a resource that can be turned into money by building a wind turbine. The answer my friend, is blowing in the wid. Fifteen minutes later the output was zero … “Oops! The wind stopped blowing!” Wind is a subsidy hog, a creature of the banks. Like other industrial ‘goods’ it cannot pay for itself. Without endless credit subsidies, there are no turbines. Even when operating as intended, ‘alternative energy’ provides but a drop in the bucket. The world’s millions of factories need hard raw materials and ignitable fuels to transform them, more fuel is needed to ship them, more to demolish them when they wear out. There are no wind powered steel mills, refineries, asphalt plants, concrete kilns, shipyards, ports, rail lines, reactors, strip mines, rubber tires, copper smelters … cranes or highrise office buildings, either. No wind powered sprawl, no solar freeways or overpasses or ‘alternative’ bridges or gas stations. A few hundred thousand electric cars does not rise to the level of rounding error. Enough electric cars to make a noticeable difference in petroleum consumption and grid has collapsed under the weight of current demand. The end of the internal combustion engine is coming whether folks like it or not, whether they think our climate problems are a scam or not. We have eluded consequences for our greed and stupidity for 565 years. All of these consequences look to appear on our doorsteps at once … right now! Our massive bloat of human flesh and cranky metal junk will be reduced to ashes and dust, to blood and tears one way or the either … by some form of common sense and hard-headed management … or by force of events. There is no easy way out of this. Throwing money at machines and pretending they can solve the problems caused by too many machines = failure. The attempt is no different from borrowing your way out of debt. Wolf – We should keep that all time instantaneous peak of 12,238 MW in perspective. I’m involved in the power generation industry rebuilding steam turbines, mostly coal. A good sized coal turbine is anywhere between 500 -750 MW and a single power plant may have 4 or more turbines. These are producing steady power, not instantaneous peaks. So the windmills that litter the landscape can generate an instantaneous peak of what a few power plants can generate steady. Coal power plants are for base power – steady power. They can’t ramp up quickly. They run most efficiently at a constant level of output. But power demand, as you should know, being in the industry, comes with all kinds of variations and spikes, and so coal power must have peaking power plants (such as natural gas) to back them up. Guess what? It’s the same with wind power. Except that coal is not competitive with nat gas base power (combined-cycle turbines), and far filthier than any other fuel. Cheap nat gas is killing coal for financial reasons – not environmental reasons. Coal power plants are getting shut down left and right, replaced by nat gas plants and renewables. But you should know all this, being, as you said, in the industry. Banks may be eager to lend into com’l real estate, but they aren’t accelerating lending into residential mortgages, mortgage purchase apps are not picking up much. CB Richard Ellis has probably sold every class A Multifamily apartment complex in the last few years. They do not even list with a price. They just say all bids due by a certain date. It’s even nuttier than the 05-07 avalanche. I’m pretty sure some are going for negative CAP rates now! Instead of investors, we have FED watchers today. Another sign Resengren apparently missed is the stock market, with it’s bad news is good news paradigm. This is mysteriously connected to QE, and the momentous event of lifting interest rates by 0.25 points. commercial real estate, multi-family, single family homes and autos in early signs of a bubble. Makes me wonder what the late sign will look like. Yes, cranes indicate lots of money being spent on RE construction. When I visited, Doha Qatar in 2014 they held the world record. 80% of the cranes in the World are in Doha. It’s unreal. What an amazing site for real info and pov’s. I think all regular readers here must be gold bugs, even if they do not discuss it too often. The Miami Herald is reporting that a luxury condo project is being scrapped by the developers. They are also reporting that the Feds will be auctioning 2000 foreclosed homes to non profits for rehab. It all points to lower prices. MS New York – you are correct. I have been living in Summit, NJ for 41 years. Today, prices for single family residences are almost back to 2007 level (still 10% below). Demand is pretty strong. The buyers are young wall streeters with kids. The consensus is that the run-up in price is unsustainable. However, large store front retail spaces in prime downtown remain vacant. But yes, expensive rental condos are going up everywhere. Who is going to occupy those condos is unknown. Bars close here at 1 AM – no night life for young movers and groovers with money. The units are too small for families. And too expensive for families too – you can still buy a decent small house here with land and garage for $700,000. Re: tax incentives for oil cos- I think the mother is the depletion allowance. I.E., the tax man says: You produced X barrels of oil. Co’s Accountant replies: We took X barrels out of our reservoir in the ground. Yes we made a profit but since we depleted the reservoir that is a deductible loss against that profit.